I grew up outside of Boston, went to college in Boston, watched many Boston Marathons, and Boston is always in my heart. 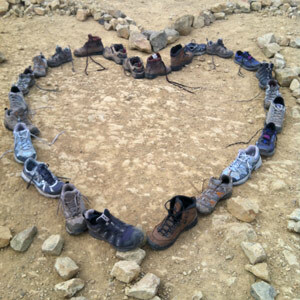 Living in California now, I’ve spread my love for Boston to my friends and your heart inspired us to do the attached photo of our hiking boots on our hike last Sunday. With much love to Boston we dedicated our hike to Boston and its runners and spectators and anyone who has Boston in their heart.